Brown or amber colored glass is obtained with the addition of iron, sulfur and carbon during the manufacturing process. The tinted glass provides protection from sunlight that would otherwise degrade the contents of the container. Amber glass absorbs the most ultraviolet radiation, which makes it ideal for storing light-sensitive materials such as botanical extracts, herbal oils, natural skin care products and more. 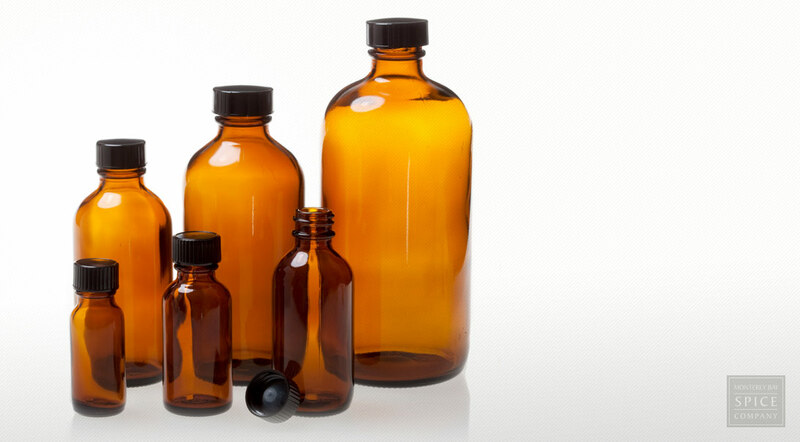 Our amber narrow-mouth glass bottles are available in 4 sizes, and each comes with a Black Ribbed PolyCone Lined Phenolic Cap designed to create an exceptionally tight seal. The cap's PolyCone liner is made of an oil-resistant plastic, which offers a superior barrier. Compact and convenient, our single ounce narrow mouth amber bottle comes with its own tight-fitting dropper. You’ll want to keep a supply of these on hand so you’ll be ready to package and store your best herbal creations when needed. Use to store essential oils, perfume blends, serums, extracts and other products.